Suitable for: Cattle, Pigs, & Sheep Easy choice of 5 fixed dose settings. Cost effective, reliable, and durable to save you money. Built in needle magazine saves you time. Ergonomic fingertip action reduces hand strain. 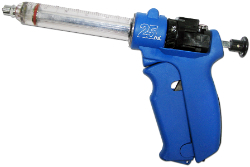 Equipped with a very high strength, crystal clear, long lasting barrel which is suitable for use with most animal health formulations.